Director Jordan Peele first wowed audiences with Get Out in 2017, garnering critical acclaim. It was a fantastic thriller that creeped viewers out in a distinct and relatively fresh way. Peele combined a mundane setting—the suburban home of a wealthy white American family—with a slow, nervous build-up towards a surreal twist-ending. Together, it made for a hair-raising, uncanny experience. Peele takes a different approach with Us and seems to aspire to something else as well. What the film aspires to, though, is rather enigmatic. The movie starts off by telling viewers about the fact that there are thousands of miles of tunnels underneath the United States, many of which have no known purpose. Viewers are then transported to 1986. A young, black girl named Adelaide (Madison Curry) is enjoying a night of fun at the fairgrounds with her mother and father. With her parents’ tense relationship in the backdrop, she meanders away from her distracted father. Adelaide plods along the nighttime beach of Santa Cruz, and with a bright, red candied apple in hand, she makes her way into a house of mirrors called “Vision Quest: Find Yourself.” She goes deep into the funhouse, made creepy with its doubled images and dim lighting. When the power cuts out, the frightened, young Adelaide tries to find her way out. It’s in this funhouse that she experiences a trauma that sears itself into her mind. Now, in the present day, the adult Adelaide (Lupita Nyong’o) is married. Her husband Gabe (Winston Duke) is driving, with their older daughter Zora (Shahadi Wright Joseph) and younger son Jason (Evan Alex) in tow. The well-off Wilson family is visiting their beautiful summer home for a vacation in Santa Cruz. A foreboding series of coincidences leads up to a strange turn of events. One night, a menacing family of doppelgängers—disfigured twins of the Wilson family—show up on their doorstep, motives unknown. Dressed in red jumpsuits and armed with long, sharp, golden scissors, they invade the Wilson home. Adelaide and her family struggle to survive the disturbing attack, leading them to discoveries that reveal that the attack is just one small part of larger plan. Strangely enough, for a movie with such a creepy premise, there are more laughs than thrills in the film. Rather than letting the tension build during what should be disturbing scenes of violence, such scenes are often capped off with a quip or comedic action. Still, while there isn’t much to get scared about, there’s certainly much food for thought. The film doesn’t play into the expectations of a home invasion film—there aren’t any elaborate security systems or fantasies of self-defense. Instead, it draws out a theme that revolves around the intricate tethering of a happy and successful social class with the suffering of the shadowed underclass. Tonally, the film gives off a zombie apocalypse feel. With irreverent humor and social commentary, it recalls the British flick Shaun of the Dead. Does Us succeed in all the ways Peele intends? 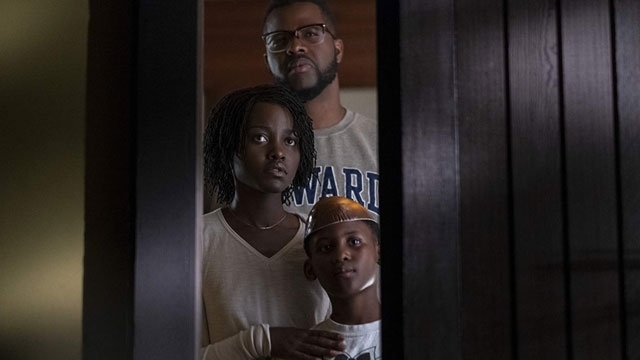 With all of its metaphors and allusions, Peele seems determined to have his film raise questions and make a statement about American society. What is the meaning of the Hands Across America theme? What are the implications of the spine-tingling ending? Who are the Tethered and what’s the next step in their plan? Audiences with an interest in sociopolitical issues in the United States may have a lot to talk about. However, those who seek a thrill could easily turn their attentions elsewhere as the movie’s pacing is a touch slow at times due to a lack of tension. But with all the things that are hinted at yet left unanswered, it may very well be that Peele has bigger plans for Us.